Carol Moore says: Beautiful! You are so fast and I am so slow. I think I try to get to detailed and then it takes me sometimes a while to find the right reference photo. ~ Reply? katerina Koukiotis says: thank you carol xoxox i remember one time i only did 3 sketches, i dont think you're slow i think aceos go by a bit faster ;)plus i have more free time, what i learned by doing the sketch fest for the last 3-4 months for bigger artworks i mostly do linework sketching and for smaller ones like aceo size i add color which makes it go faster than shading only the drying part may take a little while. When working from references what i do is have a folder that comes handy if i need to look something up that helps,maybe you can do something similar :)	~ Reply? Anon says: I love that orange Katerina, you use that a lot in your works. ~ Reply? Ellen Million says: That is beautiful - I want to touch her hair! ~ Reply? Coriander Shea Detwiler says: Wow! I love love love her hair! I want hair like that!! ~ Reply? katerina Koukiotis says: thank YOU lisa, ellen, corrie so much xoxox i love orange i think it brings out any skintone or color scheme makes it pop up-to get the hair color i first applied organge but it was too pale so i added another layer of red paint this time and it made it a bit more vibrant :) I think hair stylist should do the same mix the colors to get nice shades of red..;) :)	~ Reply? says: Frizzy red hair and freckles! LOVE! ~ Reply? Deanna says: I love the monochromatic color scheme. It kind of looks like the white areas are birds in her hair. do you see that too? ~ Reply? Janet Chui says: Love her hair! ~ Reply? Kate says: Really, really nice! Loving the colour! ~ Reply? 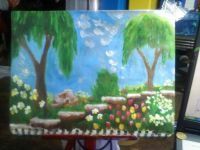 katerina Koukiotis says: thank YOU everyone so much xoxox deanna they are supposed to be little while flowers ;)but i can see some of the shapes looking like little white wings :)	~ Reply? Jenny Heidewald says: Coriander stole what I was going to say! Her hair is so soft and beautiful. ~ Reply? katerina Koukiotis says: thank YOU jenny xoxo	~ Reply? Ally Loughrin says: Holy moly this is lovely! I envy her her hair. :) I wish my henna would turn my hair THAT color! ~ Reply? katerina Koukiotis says: lol..thanks ally so much xoxo wish i haircolor like that too ;)	~ Reply? Carole Graham says: Nice one! 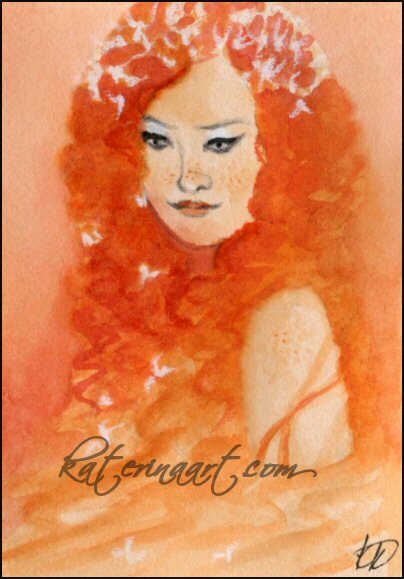 :) Reminds me of a modern interpretation of a Pre-Raphaelite painting - they had a thing about red-heads too! ~ Reply? katerina Koukiotis says: thank you carole for the lovely comment !! xoxo i was going after the look a bit I'm a big fan of Pre-Raphaelite art :)	~ Reply? Noreen says: Can I add more raves about the color?!!! ..And the freckles!!! Love it! ~ Reply?